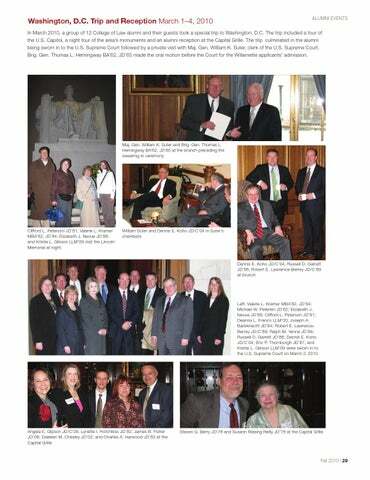 In March 2010, a group of 12 College of Law alumni and their guests took a special trip to Washington, D.C. The trip included a tour of the U.S. Capitol, a night tour of the area’s monuments and an alumni reception at the Capital Grille. The trip culminated in the alumni being sworn in to the U.S. Supreme Court followed by a private visit with Maj. Gen. William K. Suter, clerk of the U.S. Supreme Court. Brig. Gen. Thomas L. Hemingway BA’62, JD’65 made the oral motion before the Court for the Willamette applicants’ admission. Clifford L. Peterson JD’81; Valerie L. Kramer MBA’82, JD’84; Elizabeth J. Nevue JD’88; and Kristie L. Gibson LLM’09 visit the Lincoln Memorial at night. Left: Valerie L. Kramer MBA’82, JD’84; Michael W. Peterkin JD’82; Elizabeth J. Nevue JD’88; Clifford L. Peterson JD’81; Deanna L. Franco LLM’00; Joseph A. Barbknecht JD’84; Robert E. LawrenceBerrey JD/C’89; Ralph M. Yenne JD’86; Russell D. Garrett JD’88; Dennis E. Koho JD/C’04; Eric P. Thornburgh JD’87; and Kristie L. Gibson LLM’09 were sworn in to the U.S. Supreme Court on March 3, 2010.